bhurbhusi village in Chhattisgarh's Raj Nandgaon district is facing the threat of submergence due to the construction of a Rs 70 crore dam on the Seonath River. While the work on the Mogra dam proceeds on a war footing, the government rules out any displacement it might cause. But it has very conveniently forgotten to include this tribal village in its assessment surveys. Bhurbhusi residents complain that only 32 villages were studied for the dam's impact when the dam proposal mooted in 1975 mentioned 56 villages to be surveyed. They also allege that the survey was conducted after the dam's construction had already begun. The dam is expected to be commissioned by the end of 2005. 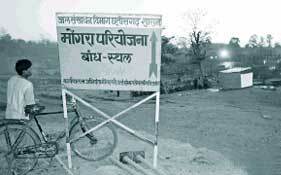 "The government has not surveyed this village. It will be washed away once the work on the dam is complete," complains Ram Nath, a resident of Bhurbhusi. Social activists believe the project, which was pending for over 25 years, was suddenly revived in 2003 to cater to industrial units some 20-30 kilometres away from the villages. Painti Bai, a member of the Bhurbhusi's mahila sangathan (women's organisation), harbours no illusions: "The dam is not meant for us". But the government says the project is aimed at irrigating 9,500 hectares of land for the kharif crop and 2,500 hectares for the rabi crop. "There will be no displacement of people. Only agricultural land will be submerged, not the villages," claims the irrigation department. It also highlights the fact that about 1,500 labourers are getting good wages in the ongoing dam construction work. The government says it will rehabilitate 12 villages in the first phase by providing proper compensation. But Sonaram Sahu, a social worker, points out that the compensation will be inadequate as it will only be financial in nature and won't include any livelihood options. "We must get compensation as land, not money. We need employment generation to survive," demands 24-year-old Laxman Laltharam, resident of an affected village. The mahila sangathan's chairperson Hiran Bai alleges that the government has created a rift among villages and has got some gram sabhas to approve the dam. Mogra village, which will also be submerged totally, is supporting the dam.